2. The high performance of tight,waterproof, dustproof and shockproof, high waterproof rate IP67, Anti explosion. 6. We can develop the new items according to customers' special requirement. 1. Off-road vehicle, ATVs, truck, engineering vehicles (excavator, treedozer, mining truck etc.). 3. After connecting with an 110V/220V power switcher, also can be used for public buildings. 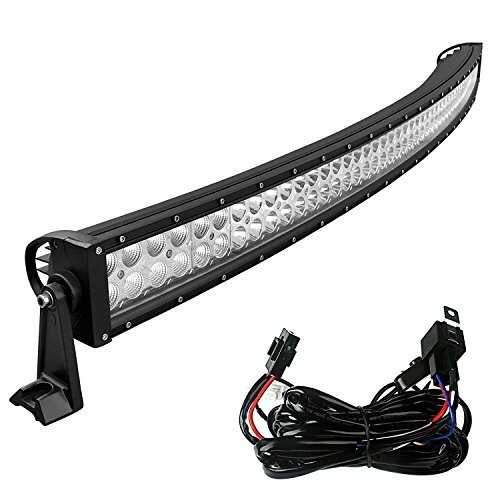 LIGHT UP YOUR ROAD: Features a curved-design diecast aluminum body with jaw-dropping dual-row 27,000 Lumens pure white light, SOLCO 52" Offroad LED Light Bar is an ideal choice for off-road use and will light up everything in front of you. RUGGED CONSTRUCTION: SOLCO offroad lights are built tough for use on the roughest terrain. This 50 in light bar has a waterproof rating of IP 67 plus long lasting corrosion resistance, perfect for the muddiest trails. COMBO BEAM: The combination of two 60-degree flood beam and one 30-degree spot beam makes it lighter and wider to give you an incredibly clear visibility in any terrains, which helps avoid potential hazards on the road ahead. UNIVERSAL FIT: This curved light bar can be compatible with almost all Jeeps, 4x4, Trucks, Cars, Motorcycles, SUVs, ATVs, Boats. Besides that, this universal offroad led light bar also works great as driving light, fog light, or for emergence use. Money Back Guarantee: Making you a happy customer is our guideline. Your satisfaction is backed by our Risk-free 30 Day Money Back Guarantee, and Lifetime Warranty against any defects. Give it a shot, you will never go wrong with the SOLCO LED LIGHT BAR. If you have any questions about this product by SOLCO, contact us by completing and submitting the form below. If you are looking for a specif part number, please include it with your message.